Did you or someone you know have testosterone therapy? Did you or they suffer a heart attacks, stroke or other heart-related issues after receiving testosterone therapy? Did you or they take on negative side effects after taking Testosterone products or supplements? 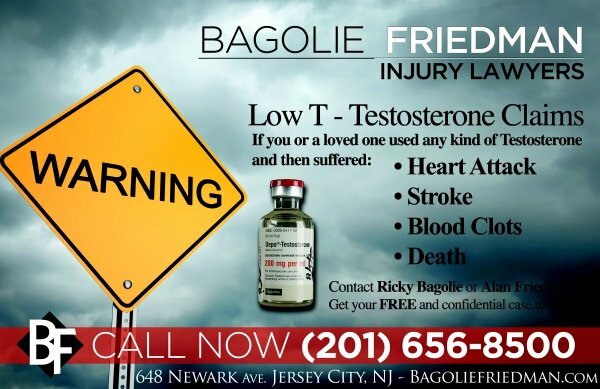 Contact Bagolie Friedman Accident Lawyers Now! Low-T product manufacturers may be to blame. These products were intended to treat low testosterone (“Low T”) in men, becoming particularly popular among younger men who are looking to enhcance their physical side, and older men who want to counteract signs of aging. The concern is that these products have been found to have serious side effects along with long-term risks, especially the heart. Men who suffering with side effects or who have had heart attacks and strokes have indicated they were not properly warned of these risks. It is likely we will see an increase in Low-T Testosterone lawsuits, depending on how pharmaceutical companies market these products to elderly men or healthy men with no history of hypogonadism (low testosterone). In March 2015, a safety warning emerged saying testosterone drugs may increase the risk of stroke, heart attack, and death in men taking FDA-approved testosterone products.